This week has a theme. Autumn Brunch! 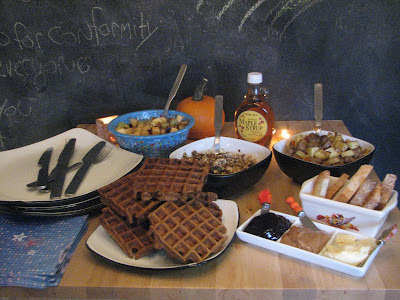 This Sunday I invited a few friends over and made them a complete Autumn feast. All week I'm going to feature recipes from the brunch. Everything went along perfectly. So perfect in fact that I wasn't worried about taking beautiful photographs of the goods. I did take regular photographs though! 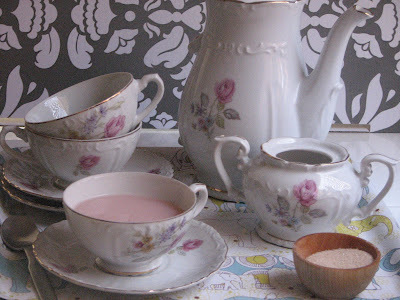 Today features the beverages: Ginger Champagne and Ginger Bread Cookie Tea! I got the idea from my homemade ginger ale. I figured, if I could mix the ginger syrup with bubble water, I could probably mix it with champagne. This was a HUGE hit. A very festive, refreshing and welcomed change from mimosas and bloody marys. 1. Place ginger, water and 1/2 c. sugar in a small saucepan. Stir to dissolve. Bring to a high simmer (not quite a boil) and let simmer until in gets thick and syrupy, about 5 - 10 minutes. Set aside. 2. To make rim sugar, put a small amount of sugar in a bowl. And ground ginger and cinnamon to your taste. 3. 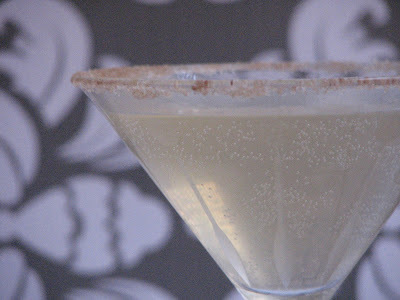 Wet the rim a of cocktail glass (or champagne flute) with a little ginger syrup and coat with the spiced sugar. Mix 1 part syrup - 2 or 3 parts champagne. Pour into glass (or flute). Drink! 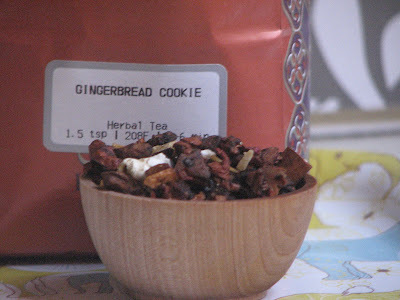 Using my Great Grandmother's tea set, I served up my favorite tea: Ginger Bread Cookie from Teavana. 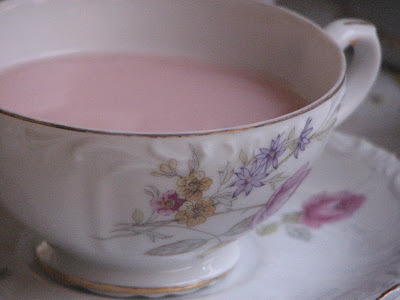 An herbal tea with a beautiful pink color, Ginger Bread Cookie uses a bunch of different foods and spices to get it's flavor. From dried fruits to cinnamon sticks to popcorn, it tastes more like Autumn and Winter to me than any other beverage. It's on sale on the Teavana website so go and get some! I drink mine with soy creamer and vanilla (or spiced) sugar. Recipes coming up this week: Tofu Scramble with Caramelized Onions, Tatsoi, and "Bacon" Bits, Gingerbread Waffles, Sweet Potato Hash with Sausage and Peppers and more!